photo-eye Gallery Photographer's Showcase: Michael Lange photo-eye Gallery is pleased to announce WALD, by Michael Lange, new to the Photographer's Showcase. 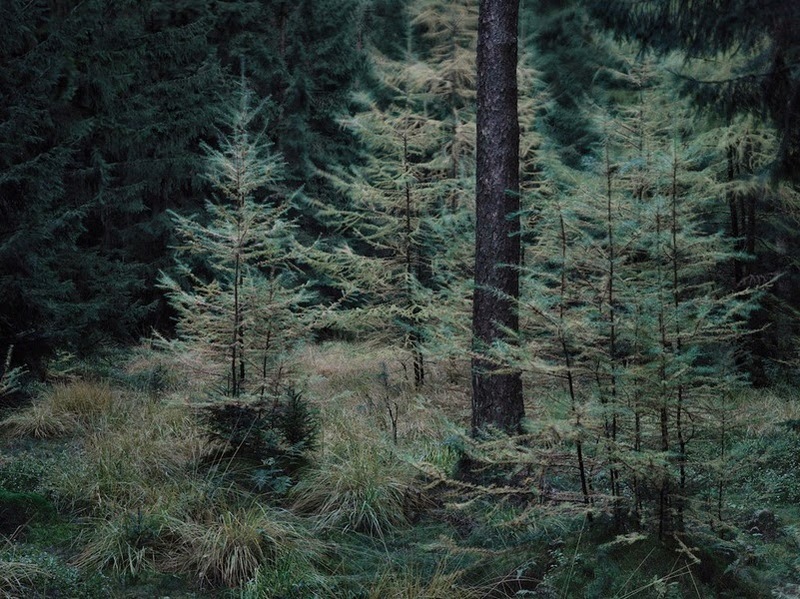 We sat down with Lange on his recent trip to Santa Fe to discuss his two portfolios – WALD and FLUSS (which we will publish next week) — and the beautiful, dark photographs he has been making in the thick forest along the Rhine River in Germany. photo-eye Gallery is pleased to announce the portfolio WALD by Michael Lange, new to the Photographer's Showcase. 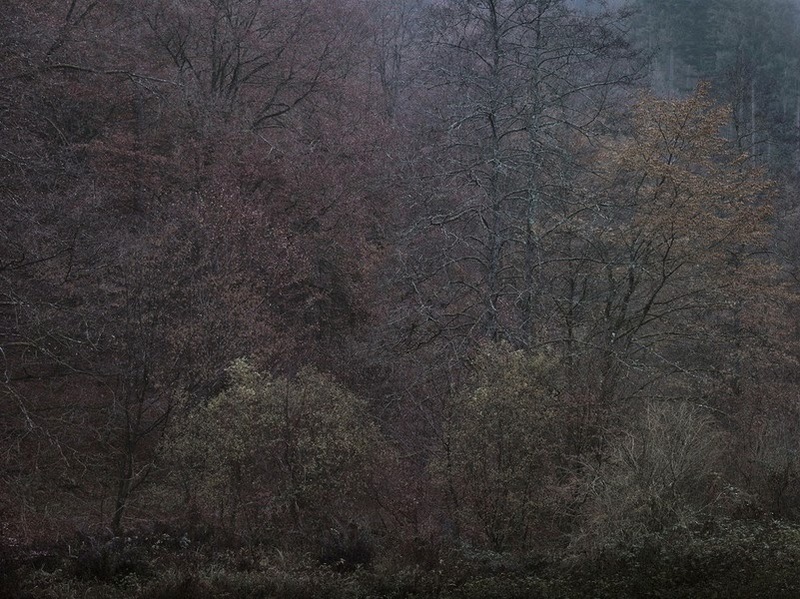 We sat down with Lange on his recent trip to Santa Fe to discuss his two portfolios – WALD and FLUSS (which we will publish next week) — and the beautiful, dark photographs he has been making in the thick forest along the Rhine River in Germany. Erin Azouz: I am curious how the WALD project began. How was it conceived and what inspired you to photograph this lush, beautiful landscape? Michael Lange: When one wishes to do a personal project one has to be willing to open up to private stuff and to go deep. In order to go deep it’s good to have a safe base. Since my early childhood the woods have been a safe base. At my family home there was a lot of stress and fighting. The forest behind the house was my refuge. All together WALD was a slow process, a kind of incrementalism. This was my first landscape project. A personal approach was needed, a photographic language demanded. So over weeks and month I literally let myself get lost deeper and deeper into the woods and tried many different techniques, perspectives and approaches. I needed time to find the right camera system, for the decision to work with just one lens to be photographically as consistent as possible — to learn how to widen the visual angle by doing diptychs and triptychs. 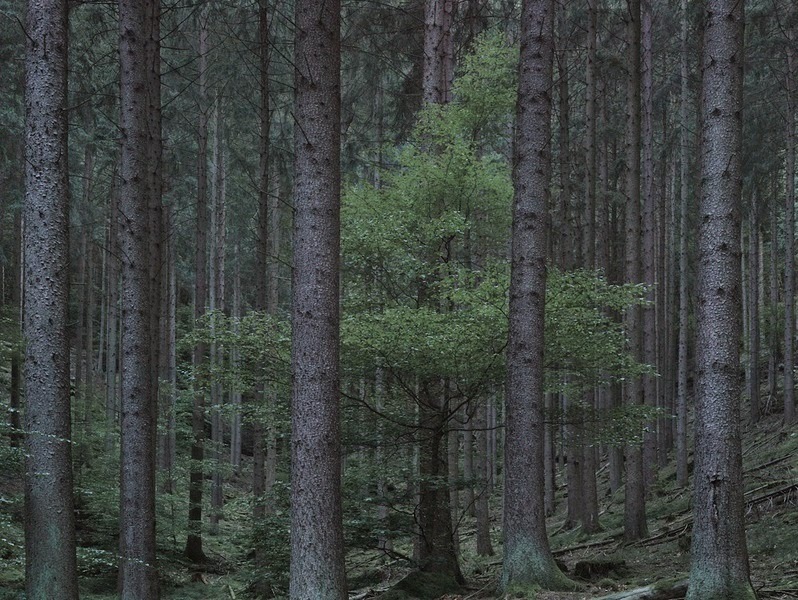 In the vastness of the forests I created a system of orientation for myself. I learned to read the ranger maps, to mark my locations, to find my way back to places of interest sometimes deep in the hidden wilderness, to not get lost in the dark. It took months until I understood the richness of dusk and dawn, and that twilight could be the prime time. Then I had to comprehend the weather — the features of the rain, drizzling, or downpour, the mist and fog, the conditions of frost and rime, and how this was connected to my feelings regarding stillness and longing. I had to learn why certain locations cast a spell on me and why sometimes places of great beauty ended up in boring images. In the first year it was a lot of trial and error, as well as frustration. In the end it was most important to trust in the project and myself including all doubts and insecurities. But when you start you don’t know all these things. They surface slowly over time. It was the feeling of being at home that captivated me and kept calling me back — being immersed out there for days all alone in a world of peace and stillness. EA: It is interesting that you say the project required you to "go deeper" and allow yourself to get lost in the woods. 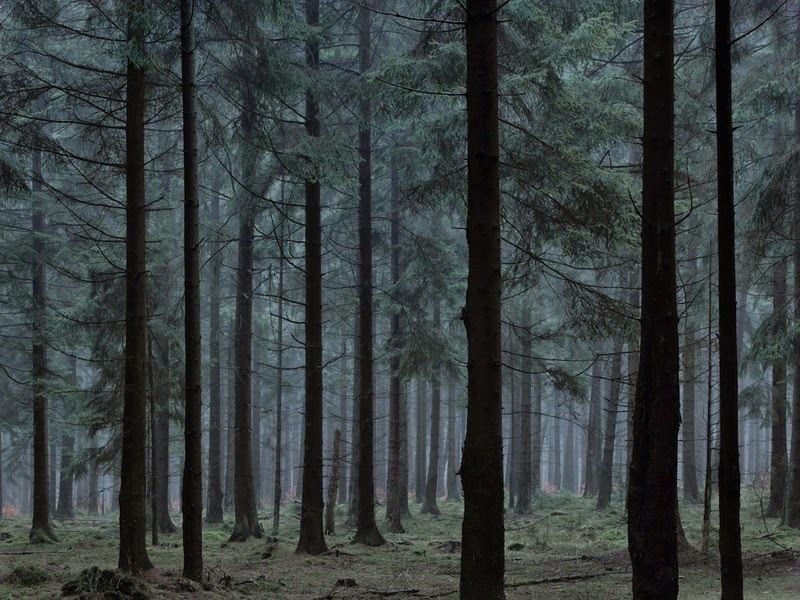 Would you say the woods act as a metaphor for a state of consciousness, a"great unknown" you wish to uncover, or is it perhaps just an escape from city life? ML: As the topic of my work is silence and stillness, there is the need to give myself as fully as possible to a situation — as well as to the unknown which plays a major role because nature is in flux and one ever knows what will happen. Looking freely and not following preconceived ideas clashes with a part of me that wants to know, that wants to be safe. These two inner voices can be very disturbing, but seem to be inevitable and part of the creative process. The limits get challenged as the brain doesn't seem to be able to solve this contradiction. Trying to get a grip on the unknown always creates a struggle. Without discipline and tenacity one hardly gets anywhere — but the instant you think you got a grip on a situation it might just dissipate. Subject to coincidences, this venture is more about finding than doing. It's a fine line one has to walk. Spending a lot of time out there helps to loosen up. That's what I mean by "going deeper." It is exciting to explore new areas, to drift and follow the inner aesthetic eye, to search and let one’s self be taken by the situations. Could this work, or would it be better the other way, what would be the best weather? It’s a kind of a treasure hunt. Once I find the potential in a place I return as often as it takes. I might come back day after day, long before dawn, always hoping for the perfect light, mood or weather. 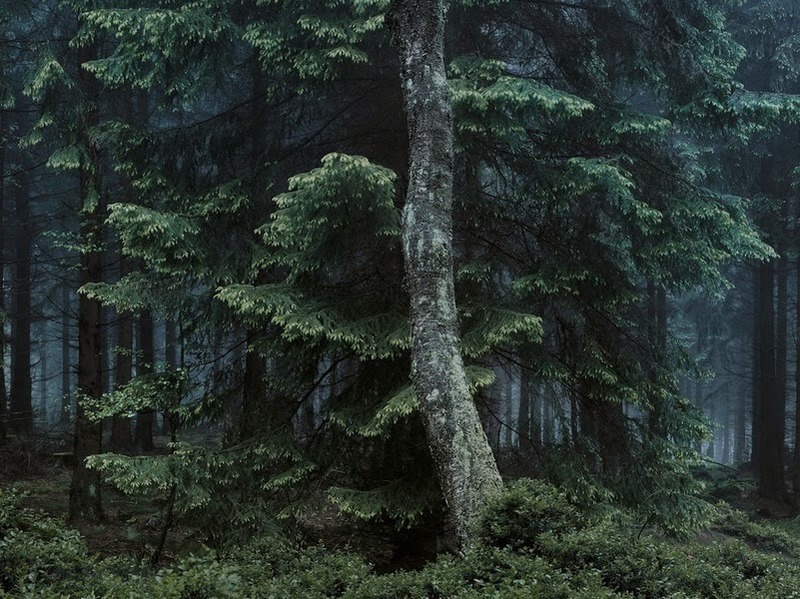 EA: There is certainly a palpable solitude in your photographs. Do you always work alone? ML: In the field I need to be alone. I try to avoid interacting with people. Frankly, I become autistic when I am out there, I lose my ability to communicate, to put things into words. There is just the moment, nature, me and the image — especially when it's pouring, as this means nobody else is out there, everything is mine and nobody will disturb me. Normally I rent holiday apartments and houses in the areas I am working in, so I can cook my meals and be by myself. I don't socialize or go to restaurants. This way I can just follow the necessities of the images, weather and light for weeks. It works well for me to come home after a day out in the field, prep my camera stuff, dry my clothes, check the maps and notes, make my dinner, watch a movie and have a glass of wine (which I regret every morning when the alarm goes off!). EA: What draws you to photograph in these low light situations? ML: In the transition from dark to dawn, nature is like a hidden beauty wrapped in a gloomy silken paper. It is light years away from a forest in sunlight. A similar effect happens in twilight, on a dark rainy day, with mist or fog. The landscape gets transformed in a magical way one often can't predict. A shallow situation might change drastically into a dramatic one and reveal a depth and fullness one could not imagine. EA: How did you get started in photography? ML: When I was 18 I was offered to take care of a photo lab in an institution helping drug addicts to get off the streets. It was an almost perfect black & white lab, including camera equipment and everything was paid for. I decided to try this for one year to see where it would take me. After a year I made the choice to fully give myself to photography knowing clearly that it would take me eight to ten years to become a professional photographer. It worked out in the end and I am still fully devoted to this decision I made 40 years ago. Another portfolio from Lange, titled FLUSS, will be released next week. For more information about Michael Lange's work, please contact Erin Azouz at erin@photoeye.com or call 505-988-5152 ext. 202.